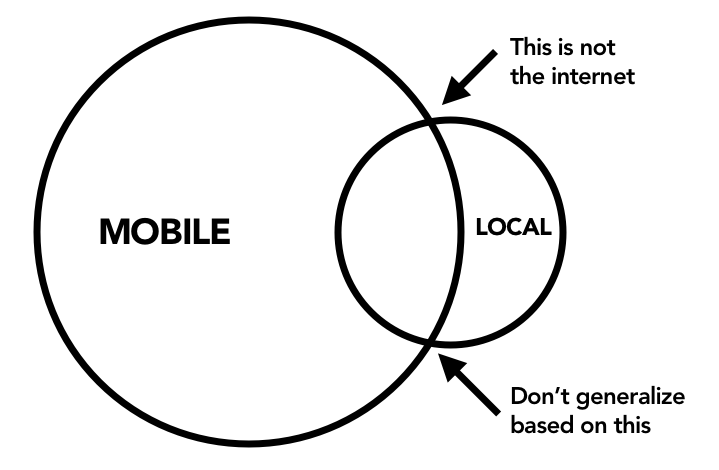 Just because someone is doing a search from a mobile device doesn’t make it a local search. And just because someone is looking for local content doesn’t imply they’re using a mobile device. Just because many local searches are from mobile devices does not imply that most mobile searches are for local information. This is one of the most hotly debated issues in content strategy for mobile right now, and I’m pleased to see this topic get so much attention from so many smart people. I don’t deny that I have a strong point of view on this subject — and it’s because I have a clear point of view that I value a healthy debate. But it does! you might think. If you’re delivering local content. Fine. Call that what it is. Let’s have a separate debate about how to do that well. Don’t confuse the rest of the people trying to deal with the bigger problem of getting content on mobile devices. Use the narrowly defined local case to figure out how to use real research and data to prioritize your content. Report back — I’m sure you’ll learn some things that will benefit the rest of us. I travel. A lot. I am like, a professional traveler. I personally am the target audience for this idea that content should be tailored and prioritized differently based on my local context. If you do that well, I would benefit. In my mind, that’s second order business. It’s a fun and interesting problem, the kind designers and developers like to solve. I personally don’t think it’s a problem that merits the focus it’s getting in this debate. First order business is getting all of our content on mobile, in a format that’s readable, navigable, and searchable. Someone called me out recently for calling that “content strategy,” suggesting that making that happen isn’t really a “strategy.” You know what? It’s not. It’s tactical, it’s wonky, and it’s hard work. It’s also our most important job. If I could prioritize the efforts of our community over the next 3-5 years, I’d spend 80% of our efforts on the problem of cleaning up our desktop content and getting it all (at least, all the good stuff) onto mobile. Let’s use our 20% experimental time to explore how to prioritize content differently based on what we think we can intuit about user intention based on device and location. And let’s give each of those problems the appropriate weight in our discussions. Let me make a long story short: just make quality, relevant content with appropriate tasks, and offer all of these to all users, unless said content or functionality is dependent upon device capabilities (such as a camera). Then make it easy for the user to decide what it is they want to do. The whole “multiple screens need multiple sites” theory just doesn’t make sense. We have never designed separate TV commercials for 13″ CRT screens and 70″ plasmas – even though people watching them are usually in very different places/situations.